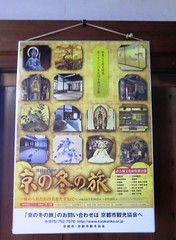 Onishi Chijo, a lead monk here at Ninna-ji, will be giving a lecture at Omuro Kaikan Hall on June 30th at 2:00pm. The event is free but is limited to the first 150 guests, seating beings 1 hour before the lecture starts. The talk is entitled “Warai to Kenko no Kokoro” (“Laughter & the Heart of Health). See the front and back of the flyer for more information. The lecture will be in Japanese.